China might be a sugar market for luxury car companies such as BMW, Audi, Bentley, Jaguar, etc., but not for high-class electric cars like Tesla due to several reasons, including the range anxiety. Sunny Zhang, a Shanghai resident ordered the Tesla Model S last April and received it in September. 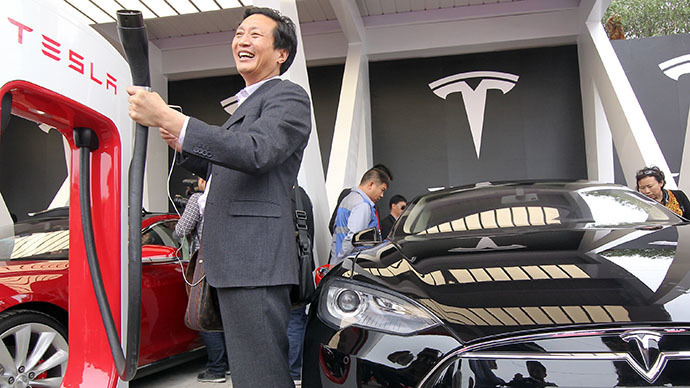 Echoing complaints from other Chinese Tesla owners, he said that it was way too long waiting for the vehicle to arrive and that after-sales service has been spotty. He’s also so afraid of running out of battery so that he rarely ventures far from his home, a very common worry called range anxiety. As Musk huddles with his China team, Tesla is rushing to expand its network of charging stations to assuage range anxiety, add luxury features that suit local tastes and retrain a sales force Musk previously described as “brain-dead”. The company is still believing in its success in China. To define the real “problem” with range anxiety, Bloomberg Business just completed a challenge: travel from Shanghai to Beijing with a Tesla Model S, using Supercharger stations to power during the journey. So, that’s the initial plan. But what really happened on the road was quite different! The original plan is to travel a distance of 1300 km (807 miles) and will stop at 6 supercharger stations. Right after they left Shanghai, the Tesla Model S reported the range of 365 km (226.8 miles). But the traffic in China was extremely packed with hundreds of cars lining on the main highway. So, instead of driving directly to the first stop place, the team ended up their first day with 416 km (258 miles) and charged twice. Everything didn’t get any better on the second day since they were able to travel only 748 km (464 miles) and charged 4 times. Beside the Tesla’s supercharger station network, the Chinese government has deployed its own charging network called Fast Charge. However, Tesla cars aren’t compatible with these stations. Other electric cars that can use China’s Fast Charge stations require 12 hours to fully charge–whereas, Tesla cars take only 90 minutes to charge if allowed to use their native Supercharger stations. In total, the team travelled 1413 km (878 miles) — 113 km more than their original plan; and they arrived in Beijing after stopping only 7 times at charging stations along the way. Range anxiety is still a big concern for Chinese buyers. And Tesla has a lot of ideas in the works to dismiss this problem. Let’s hope they roll them out soon!